There is no need to put up with a Pest Infestation when professional help is available in the St. Paul, MN area. Pests are not only scary and annoying, they can pose a serious health risk. The list of unwanted insects that invade homes and businesses is quite long and unsettling. Eco Tech is a Professional Extermination company that uses organic pest control measures that are highly effective and environmentally safe. We have decades of experience as a Residential Exterminator and Commercial Exterminator in Minnesota. Why Do I Need A Professional Residential Exterminator? Homeowners sometimes think that they can handle their pest infestation by themselves and find that the problem is bigger than what was first thought. Taking care of a few wasps, spiders or cockroaches may seem like it has an easy solution with commercially sold pest killers but you may soon realize that they will just keep on multiplying if not eliminated at the source. Not only that but toxic bug sprays can be harmful to your children and pets. A highly trained Residential Exterminator from Eco Tech will do an extensive inspection to locate the source of the problem and determine an appropriate solution. Our technicians will give you an affordable, itemized quote and then begin the eradication process. We rarely require a contract for ongoing treatments. After all pests have been exterminated, we will begin the repair process and preventive solutions. All of our services are backed with a 4-year warranty! You can rest easy knowing that your Pest Problem has been eliminated. Bugs and Insects in a commercial environment mean trouble for business owners. These little unwanted pests can spread disease and scare off customers. The last thing a St. Paul, MN commercial property owner wants to do is scare away clients or be in violation of city or state ordinances. 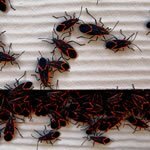 Commercial Exterminators at Eco Tech are up to date on techniques and procedures that effectively eliminate unwanted pests. Our pest control services can help to remove Ants, Roaches, Wasps, Crickets, Spiders, Beetles and many more types of insects and clean up the mess they have left. Eco Tech provides Professional Extermination and pest control services in St. Paul, MN and the Twin Cities area. We offer safe and effective Organic Pest Control treatments that give you peace of mind and protect your investment. Our experienced technicians are highly trained in both Residential and Commercial Exterminator solutions.